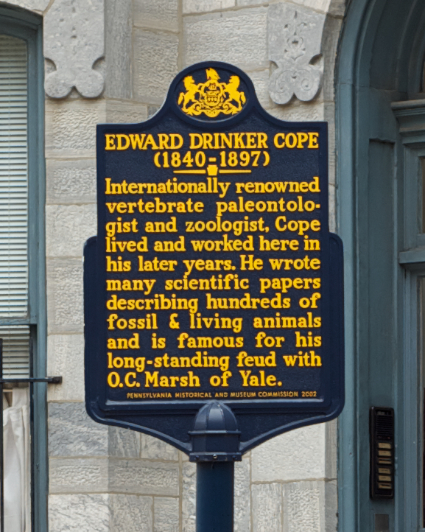 Edward Drinker Cope, the petulant paleontologist and neo-Lamarckian who complained about livestock being driven past his house and thought he was “an ideal model of homo sapiens and scientist” (see the section on “Cope’s Corpse”) lived for a time in adjoining townhouses on the corner of Pine Street and 21st in Philadelphia. He used one of the two townhouses as his laboratory and office, the other as his home. He would, no doubt, be upset to learn that his homes have been converted into apartments, quite a few apartments judging from the pile of phonebooks lying on the stoop. The solar-powered trash compactor in front of his house probably would have annoyed him as well. E.D. 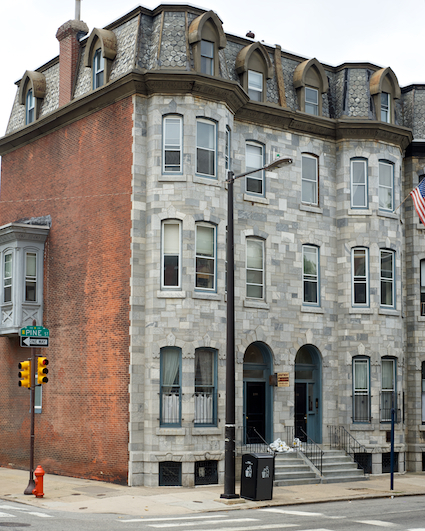 Cope’s townhouses at the corner of Pine and 21st in Philadelphia. Note the pile of phonebooks on the stoops, suggesting that these two townhouses have been subdivided into a dozen or more apartments. In 2009 the Pennsylvania Historical and Museum Commission erected a plaque in front of the townhouses celebrating Cope’s reputation. The plaque identifying Cope’s house and noting some of his achievements. Internationally renowned vertebrate paleontologist and zoologist, Cope lived and worked here in his later years. He wrote many scientific papers describing hundreds of fossil & living animals and is famous for his long-standing feud with O.C. Marsh of Yale. Strangely, they forgot to mention that just up the road, at the Academy of Natural Science, Cope had put the head of his Elasmosaurus at the end of the animals tail and then had three kinds of fits when O.C. Marsh and Joseph Leidy pointed out his error (see the brief account here). The plaque also fails to mention that many of Cope’s papers corrected errors that he committed in his frenzy to publish his results as quickly as possible. Nevertheless, Cope’s residence is another landmark in Philadelphia’s rich tradition in the history of science.